We will select a date that works for you and us, allowing enough time for your guests to receive and respond to your invite. All you need to do is decide who to invite....friends, family, co-workers, church, playgroups, etc. You are also welcome to send out a evite, facebook or email your friends as well. We like to have at least 5 Mommies or Daddies with their kids at your party. Tiny Impressions will show up about 15-30 minutes ahead of time, to set up displays for your guests to see. Then we start making handprints! We would like to reward you for your time and effort. For every dollar spent at your party, you will receive 10% towards your purchase. For example, a $400 party (approx 10 plates ordered), would earn you a free medium plate! The ceramic pieces will be glazed and kiln-fired. Finished pieces will be returned to you the host, in about 4-8 weeks. You and your guests will have made a memory you can keep for generations!! 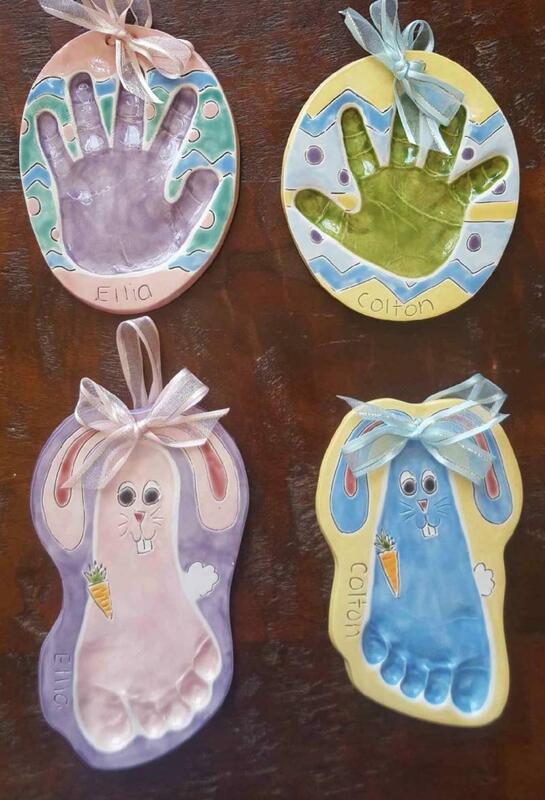 Connie makes the whole handprint process painless and easy. She can work magic with the tiniest of babies (and even Dogs!). I have been working with her for over 2 years, and am always so impressed with the finished product and how easy it is to get good prints from the kids. I have seen handprints done elsewhere, and I believe that Connie's are the most professional looking ones I've found. Way to go Connie! Donna Cuda, mother of Rowan and Ivy.